Carlo Massoud’s objects always make us think - Lacquered wood “dolls” that address the delicate theme of the veiled women; excavator trucks, made by bending rusted metal sheet by hand, that reference the 7 times his city has been destroyed and reconstructed, and of course the playful Hang Me Hangers on Letternoon.com. His work is being propelled internationally by House of Today and Carwan Gallery. Read on to find out what inspires and influences one of our favorite Beirut based designers and see his new project at The Armory Show 2016. Amsterdam based designer, Siba Sahabi draws inspiration from her German and Iranian roots to create sculptural vases out of coiled strips of felt. The finished pieces evoke ancient Mesopotamian ceramics in an unexpected medium. 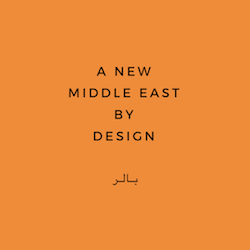 Marc Baroud has been shaping Lebanon's design talent since 2004, initially as a professor at Académie Libanaise des Beaux-Arts (ALBA) and for the last four years as the Director of their Design Department. Read on to find out what influences and inspires him in his own design practice. The son of a dressmaker and carpenter, perhaps it’s unsurprising that Kamal Aoun became a product designer with a penchant for craft. Based in Beirut, Aoun reimagines every day objects in unexpected materials and with a unique sense of whimsy.